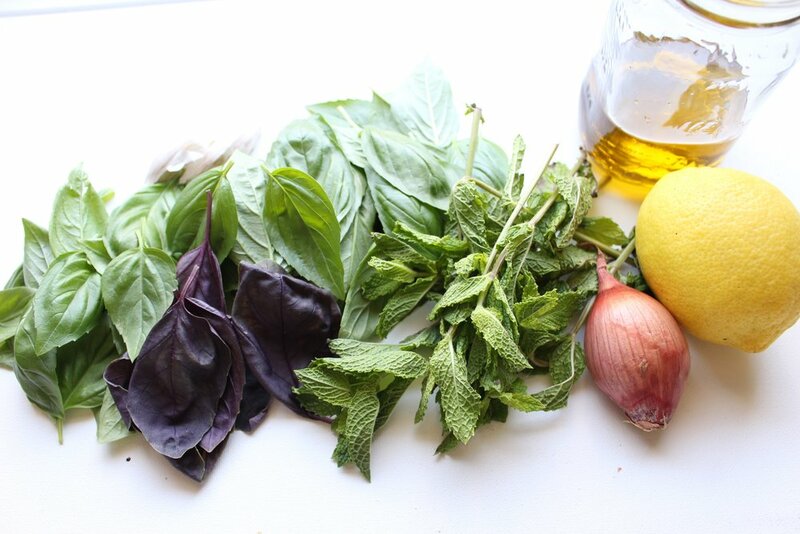 I don't know if we can go back to regular oil-and-vinegar caprese after this. 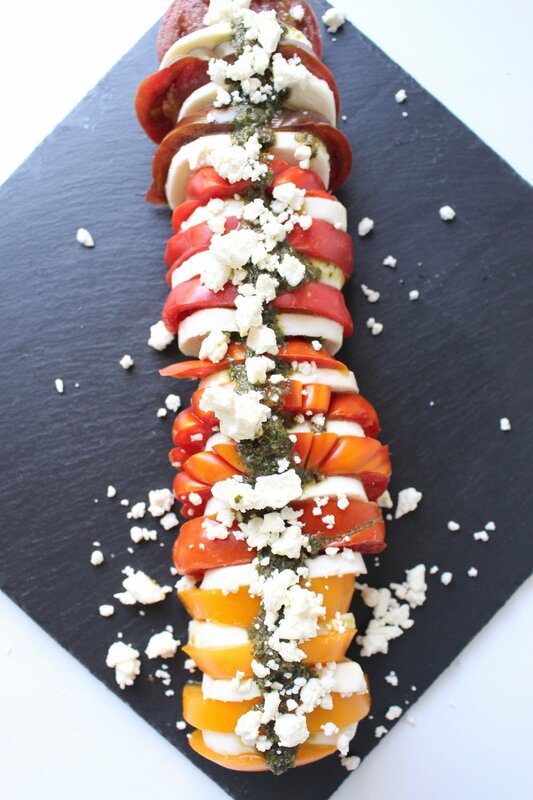 I love a good caprese salad, but I accidentally keep typing "craprese" and that's sort of a fitting description for a lot of them. If the mozzarella is rubbery or cold, if the tomatoes are mealy or our of season, and if the dressing isn't lively and tangy, then they're just...nothing. I mean, they're bad, but more than that they're just absent any flavor or texture or redeeming qualities. However, tomato season is upon us, so it's much more likely that your tomatoes will be delicious. And if you have any access to a backyard, side yard, fire escape, community garden, etc, I implore you to plant some basil and mint. Both of these plants are hardy in the summer and will save you so much money at the grocery store. AND, you'll have no excuse not to make the pesto that accompanies this caprese salad (and that you'll want to pour on everything). So, we have good tomatoes and a tangy interesting pesto, but what else does this salad need? Well, I also implore you not to serve cold mozzarella. Room temperature is SO MUCH BETTER. If you can get even a decent mozzarella, I think it's improved exponentially by sitting out for a short time (or, if you're also in the middle of our current heatwave, a few seconds?). And, I like to guild the lily by sprinkling a generous amount of crumbled, salty, briny feta on top. Is it necessary? No. Is it delicious? Yes. Should you do it? Without hesitation. Buy a rainbow of heirloom tomatoes and you have a showstopper for a dinner party that requires basically no effort (I even opted for a pre-cut cheese because I'm that lazy) and better yet, NO COOKING. Did I mention the heatwave? We ate it yesterday as Sunday lunch on our back porch with some prosciutto and salami, some Bantam Bread, and white peaches. A glass of cold rose or Sancerre would have made it heaven, but I'm old now and can't day drink without needing a nap and an Advil, so we forwent the wine. Boo. 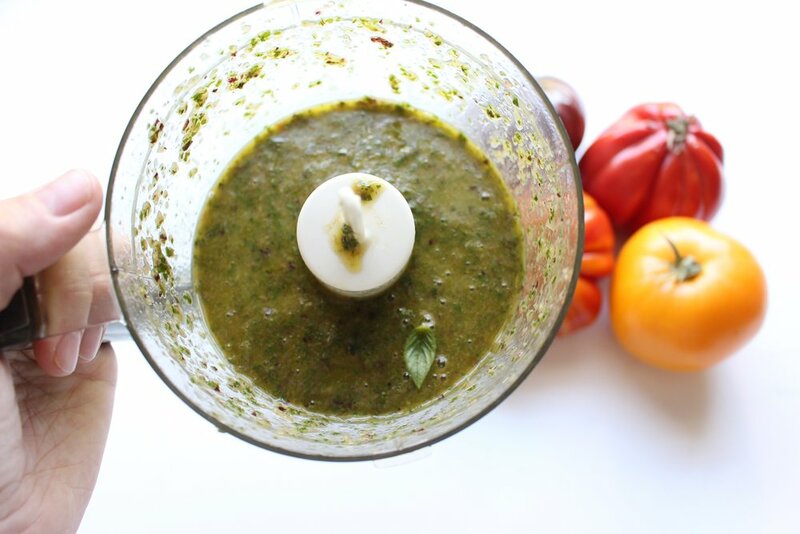 Place all of the ingredients except the oil in a large food processor or blender. While the machine is running, pour in the oil and blend until you've reached your desired consistency. Add salt to taste. 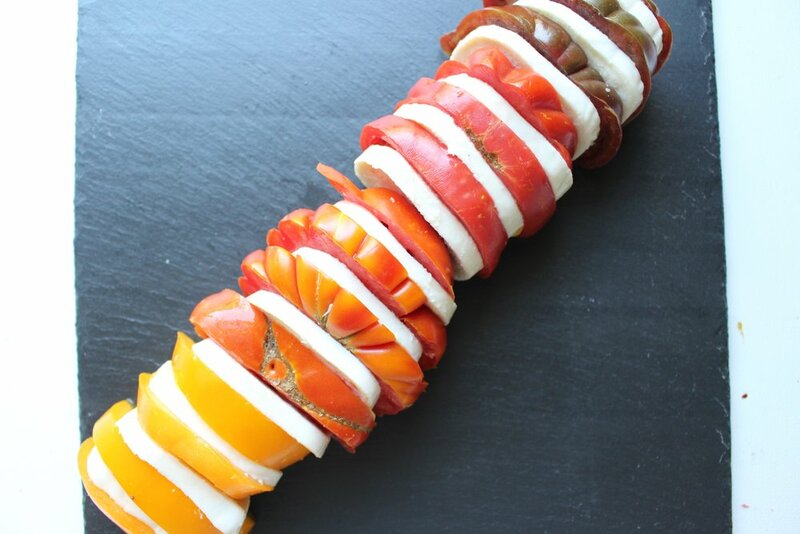 Alternate the mozzarella and tomatoes in whatever color combination you like. 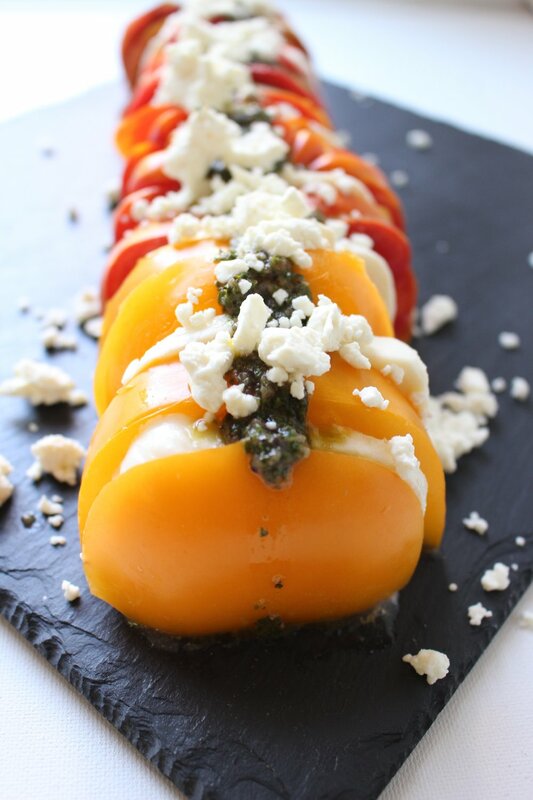 Top with the mint and basil pesto and sprinkle with the feta. Monday, you're a bummer. What should be a fresh start is always an uphill climb for me. 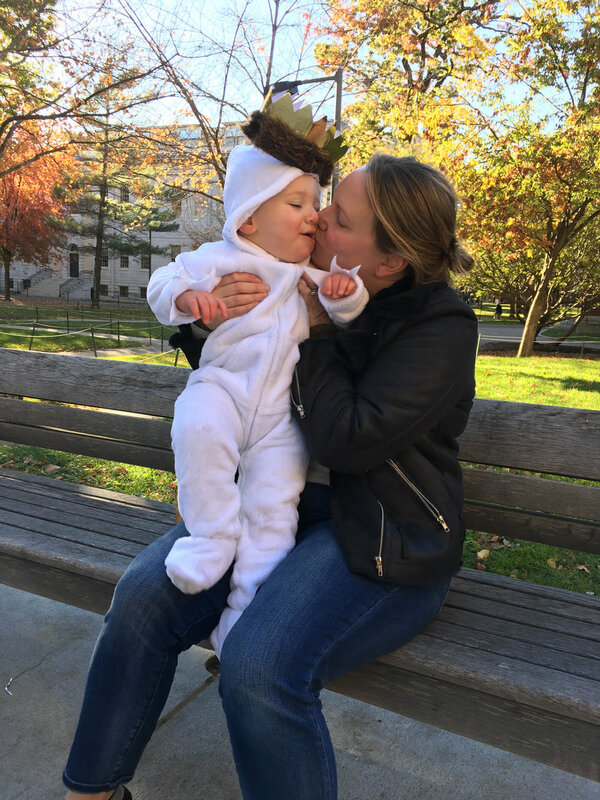 Weekends with a toddler are exhausting and getting back on schedule is tough after two days of loosening the reigns. 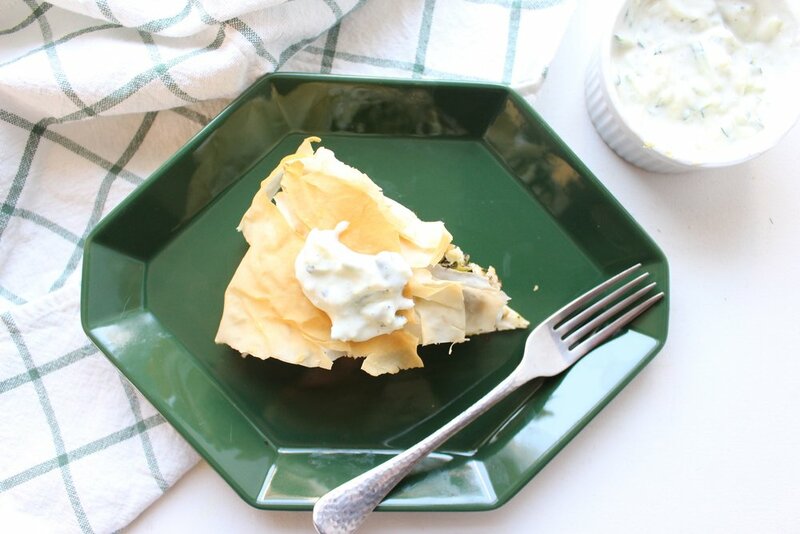 Enter, spanakopita: An easy, healthy, and totally customizable way to keep your food making and eating on track. 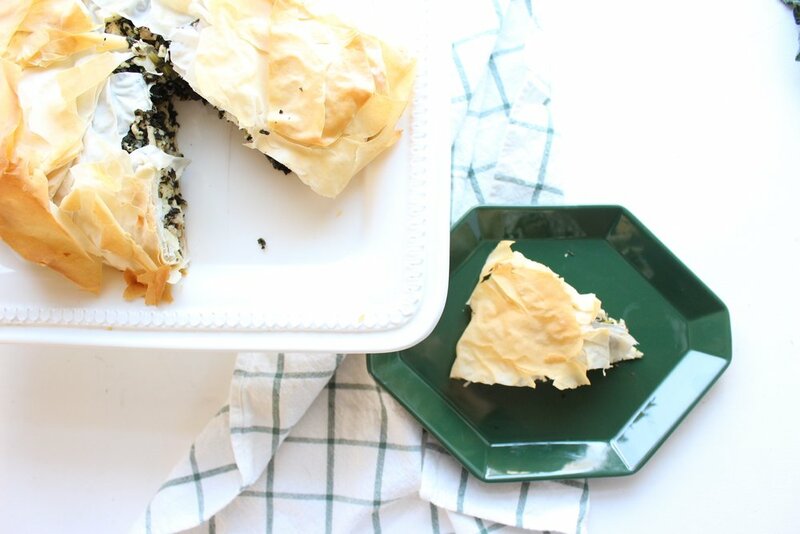 Spanakopita is a traditional Greek dish that usually employs spinach and a lot of spices (dill, oregano, etc). However, while I love spinach, M does not. And dill is my MORTAL ENEMY. So, this is my version, which uses kale, turkey, feta, oregano, and Aleppo pepper and wraps everything up in a freeform galette. The beauty of this dish is in its adaptability. Skip the meat for a veggie version or use ground lamb, ground beef, or shredded rotisserie chicken. If you can't find frozen kale, any frozen greens will do. But, definitely use frozen veggies that you thaw and squeeze dry instead of anything fresh. Don't be intimidated by filo dough. While it can dry out and crack relatively fast, we're talking about a few minutes, not a few seconds. Some people recommend covering the dough with a lightly damp towel while others recommend brushing butter or olive oil on each layer. I say, if you organize your ingredients and work fast, you don't need to do any of those things. At least, not for this recipe. *One quick note: I completely forgot to add the eggs when I made this dish for the photos! See also: "Aack! Monday!" So, yours will be considerably less crumbly than these photos imply. However, if you happen to forget the eggs in yours, it will still be delicious. If the kale is straight from the freezer, empty the bag into a large bowl and microwave for 2-3 minutes, just until the ice has melted. Squeeze well with a cloth or paper towel to get out as much moisture as possible. Set aside. Saute the turkey just until no pink remains, breaking into tiny pieces with the back of a spoon while cooking. Add the garlic, Aleppo pepper, oregano, and salt and cook for one more minute, or until fragrant. Add to the bowl with the squeezed kale. 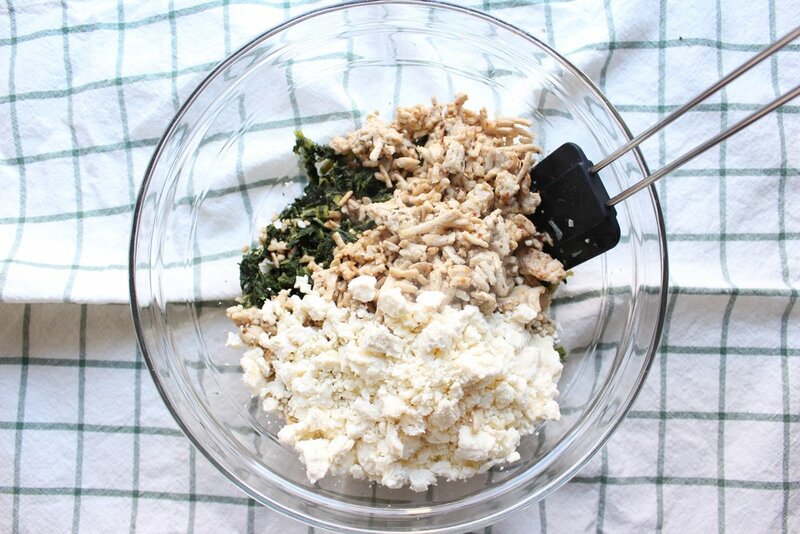 Add feta to the large bowl and mix well. Taste for seasoning before adding the eggs and adjust accordingly. Add all three eggs and mix well. Prep your workspace before opening your filo package. Cut a piece of parchment and place on a baking sheet. Have your bowl of fillings and a small bowl and brush or spray can of olive oil ready. 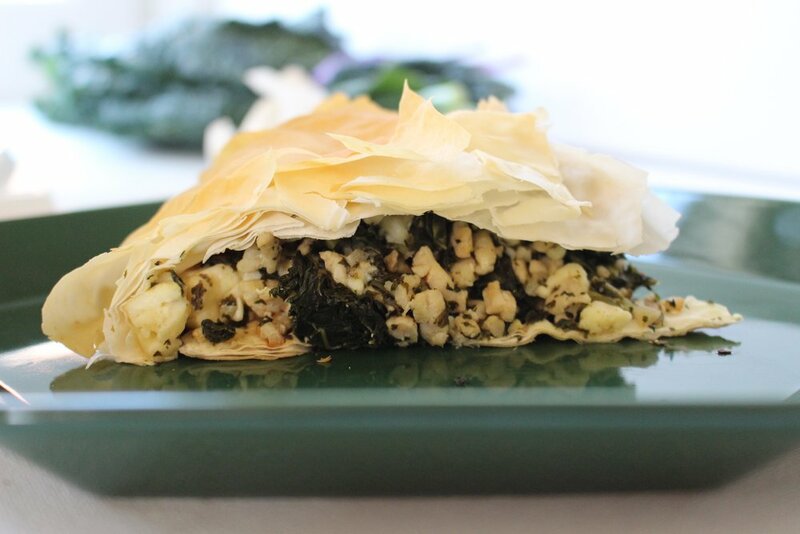 Dump the filling mixture into the middle of the six filo sheets and spray or brush the filling and the filo with olive oil. Then, wrap the sides of the filo over the filling. 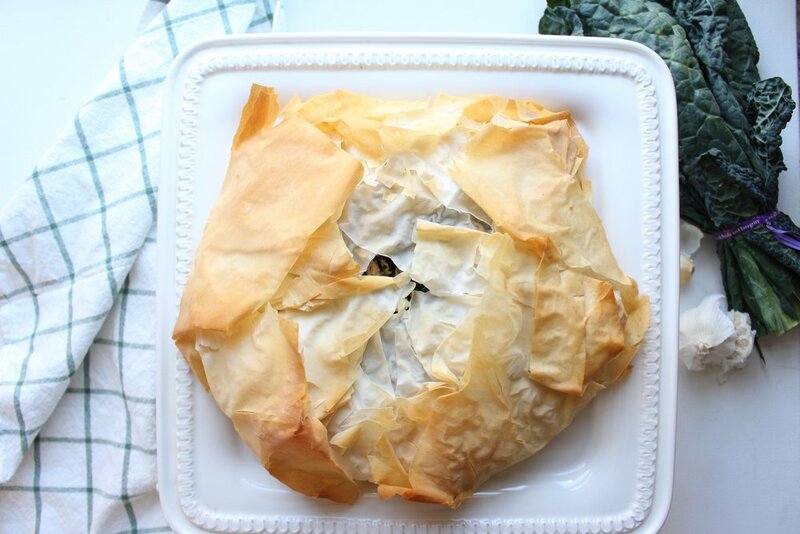 If there is a very large gap in the center revealing a lot of the filling, crinkle up one or two more sheets of filo and stick them on the top. Spray or brush the whole packet with olive oil. Bake for 25-30 minutes or until the top is golden brown.